Yogurt, cheese and milk are an integral part of Bulgarian cuisine – and in a sense, Bulgaria is the original homeland of yogurt! Dairy products are part of almost every meal in the country and a Bulgarian would find it hard to imagine classic local dishes like banitsa, musaka, shopska salad or tarator without cheese or yogurt. Cow milk is the most popular source of dairy products in Bulgaria, though sheep’s milk products are well-appreciated and quite ubiquitous too. Perhaps not as commonly consumed, goat cheeses are also traditional and considered a bit of a specialty because of their tart flavour. Native buffalo dairy products are increasingly fashionable too – buffalo yogurt from the Balkan Mountains is a real treat, especially served as a dessert with fresh blueberries! From the legendary Bulgarian yogurt (big in Japan and China!) to the secrets of the gourmet green cheese of Cherni Vit (that the Moon is made of), kashkaval tourist presents 6 delectable Bulgarian dairy products. In Bulgaria, white brined cheese (or sirene) is so universally beloved that it has come to own the word for cheese itself. Unless you specify something else, any Bulgarian would assume you’re referring to this classic Balkan cheese when you say “sirene”. Sirene can be made of cow, sheep’s, goat’s or buffalo milk, or a mix thereof. What sets it apart from other cheeses is the maturing in a brine solution, which is responsible for its white colour and its trademark saltiness. Bulgarian white brined cheese shares many similarities with its Greek cousin feta and other regional cheeses like the Turkish beyaz peynir and Romanian telemea. Compared to feta, sirene (сирене) is somewhat softer and crumblier. A variant of sirene is Dunavia, which is even softer, with less fat content and a milder flavor. Sirene is often enjoyed as a table cheese (sprinkled with some red pepper) and it’s a vital ingredient in characteristic Bulgarian dishes like shopska salad, banitsa with cheese, French fries with cheese, sirene po shopski (Shop-style sirene) and yaytsa po panagyurski (Panagyurishte-style eggs). Bulgaria is regarded as the “birthplace of yogurt”, and as you can imagine, this fermented milk product is a huge part of the local culinary tradition. Known as kiselo mlyako (кисело мляко, „sour milk“), yogurt is a yummy Bulgarian breakfast staple, and it’s also used in appetizers, desserts, beverages and even soups (think tarator). Reasonably priced, ready-to-eat and with an unmistakable local flavour, street food is ubiquitous around Bulgaria and the Balkans. In fact, snacks might be the perfect introduction to the glories of Balkan food and Bulgarian cuisine in particular! Street food is available just about everywhere around the region, and of course particularly so in the cities and in major tourist destinations. So no need to worry while you’re exploring this enchanting corner of south-eastern Europe: you’re guaranteed a vast choice of delicious oriental finger food in-between meals! Classic Balkan and Bulgarian street food has been heavily influenced by the centuries of Ottoman rule, so its taste will often remind you of Turkey and its rich culinary tradition – but always with a local twist depending on the country and region, the local climate and customs. And like almost everywhere, you’re likely to find local versions of Western street foods like pizza, hamburgers, doughnuts and sandwiches in the Balkans too – but you’d be surprised how different those can be from the originals sometimes! From the world’s favourite late-night wrap to seeds as addictive as hard drugs, kashkaval tourist presents street food in Bulgaria and the Balkans: 8 regional snacks you must try! Whether you call it döner, gyros or shawarma, this is perhaps the most recognized street food to come out of this part of the world. 陵 Originating in 19th-century Ottoman Anatolia, döner kebab is now omnipresent in all Balkan countries – and it has expanded throughout Europe and beyond, conquering basically the entire world! This heavenly combo of seasoned meat (chicken, beef or lamb), slow-roasted as a humongous cone on a rotating vertical spit and then wrapped in bread with some salad and sauce, is an entire meal in itself. In Bulgaria, dyuner (дюнер) is often sold by Turkish or Arabic immigrants, though it features some typically local quirks too. A Bulgarian dyuner will often be stuffed with French fries, which is a rarity in other places, and it will always be served wrapped in soft, thin flatbread, never as a sandwich. Chicken is by far the most popular variety and beef is to be found in the more respected döner joints, though lamb is a true rarity. 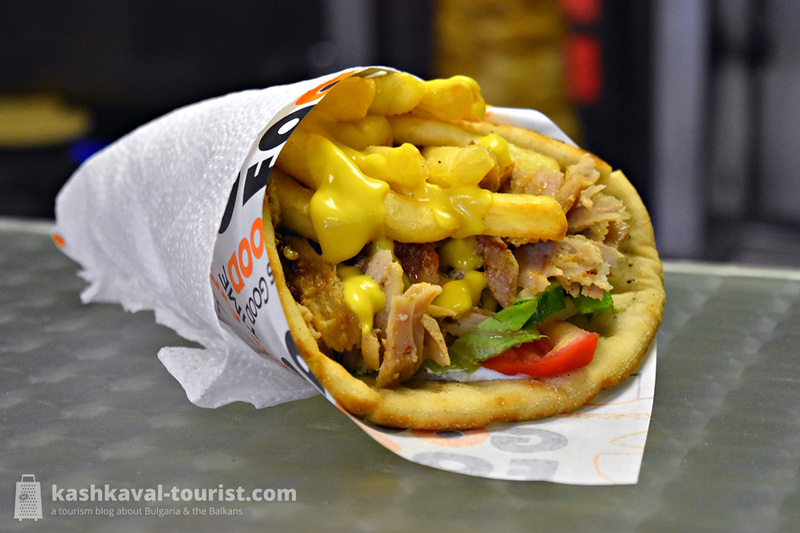 The Greek version gyros is also quite beloved: it’s notable for its thicker bread and particularly for offering pork as an option. Known as börek in Turkey, burek throughout former Yugoslavia and banitsa in Bulgaria, this flaky filled pastry is an absolute hit throughout the Balkans, be it as a breakfast staple or as a late-night snack. Prepared of multiple sheets of super thin filo dough, this piece of baked deliciousness  is usually filled with various ingredients. 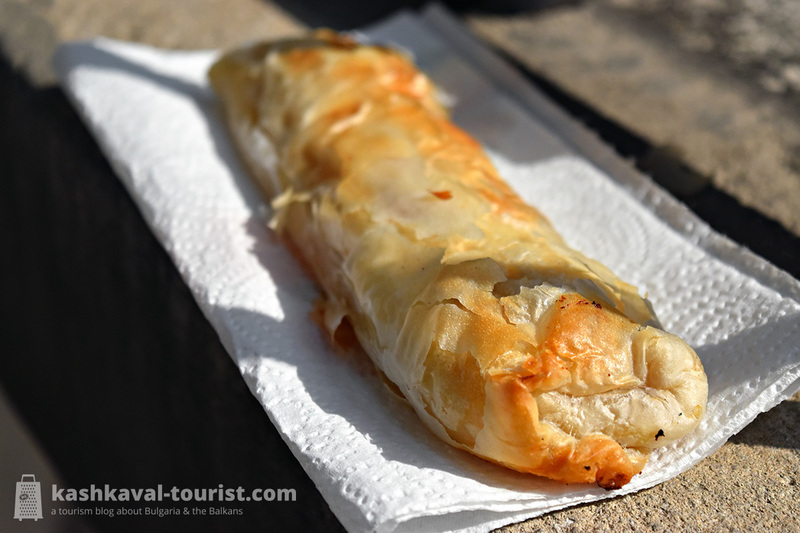 In Bulgaria, the quintessential street banitsa includes sirene (white cheese) and/or curd. In former Yugoslavia, burek is more commonly filled with ground meat. As a fast food, banitsa is sold by small bakeries that you can find on almost every busy street corner. In addition to this layered Balkan specialty, these bakeries also sell other local pastries and some Western-inspired varieties like strudel (which, in Bulgaria, is often basically a sweet banitsa with an apple flavour). In eastern Bulgaria and the Turkish-populated regions, bakeries also offer gözleme, a related filled pastry, which unlike börek is unleavened and cooked on a griddle. 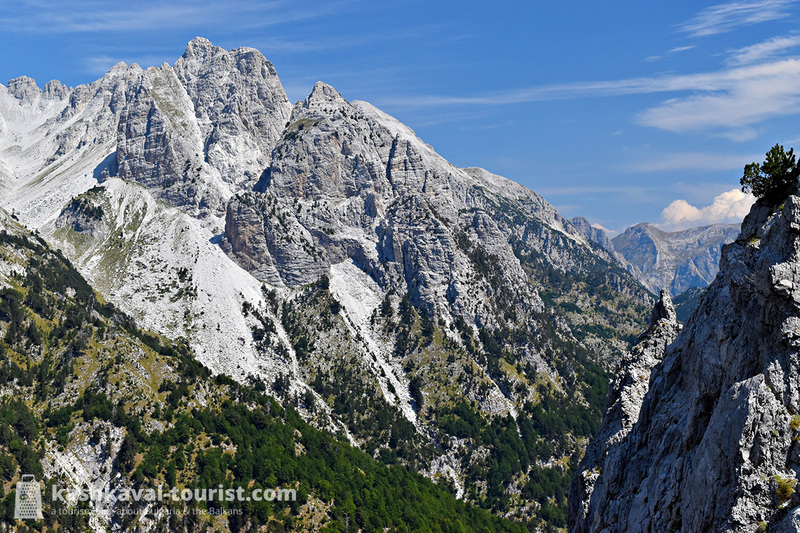 With their steep and rugged slopes overhanging kilometres above deep and remote valleys, the Albanian Alps just have to be one of the Balkans’ (and indeed, Europe’s) most stunning mountain ranges. Their menacing appearance, thanks to which they have deserved the moniker “the Accursed Mountains”, only adds to their mysterious allure. Whether you call them the Albanian Alps, the Accursed Mountain, Bjeshkët e Nemuna or Prokletije, it’s all the same mountain range, situated where the borders of Albania, Montenegro and Kosovo meet. They’re the highest section of the vast Dinaric Alps that follow the Adriatic coast of the Western Balkans. And it’s not just sheer height that the Accursed Mountains impress with: the traditional villages, turquoise lakes, elegant waterfalls, primeval beech and fir forests and authentic highlander cuisine make this secluded region the Balkans’ perfect nature getaway. Entering the Albanian Alps via one of the world’s most epic boat rides and driving out over an exhilarating and treacherous mountain pass, with loads of quality hiking and the odd lock-in tower (north Albanian blood feud anyone?) in-between, kashkaval tourist presents 6 adventurous activities in the awe-inspiring Albanian Alps. 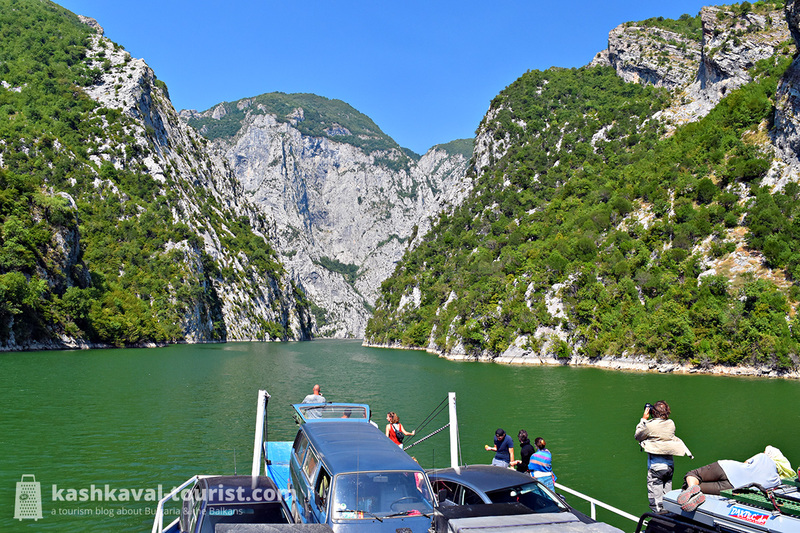 Departing on the world-famous Lake Koman ferry on a summer morning is indisputably your perfect introduction to the Albanian Alps. The ferry will take you on a three-hour boat ride among otherwise inaccessible mountain gorges. The peaks above you will turn more and more dazzling as you approach the terminus at Fierzë, but the waters retain their shade of turquoise along the way. Getting on and off the Lake Koman ferry is an adventure in itself, as friendly locals volunteer to help foreign drivers with the perilous approach on and off the ferry ramp. Quite how the seemingly erratic logistics of loading and unloading the boats works is a bit of an Albanian mystery, but rest assured, not traveller would be turned back! Once you get off the ferry at Fierzë, the gorgeous Valbona Valley is just a short minibus ride away. The glacial valley of the Valbona River is nestled between the almost vertical ridges of the Albanian Alps and the altitude difference of 1,700 metres from the river bed to the summits almost directly above it is absolutely dizzying. The Valbona Valley boasts a range of trails to everyone’s taste and ability, including a gentle path along the river, a short walk to the Liqeni i Xhemës pond or ambitious ascents of the colossal Kollata massif (2,554 m) or the highest peak Maja Jezercë (2,694 m). However, by far the most popular day hike is the steep trek from Valbona to Theth via the Valbona Pass (Qafa e Valbonës) at 1,795 m. This six to eight-hour trek of medium difficulty will take you through secluded stone villages and ancient beech forests, along pristine mountain streams and just below the intimidating peaks of the Accursed Mountains. On either side of the pass, there’s a basic café where you can stop for refreshments or fill up your water bottles. Fish and seafood play an important part in many national styles of cooking, and Bulgarian cuisine is no exception. Thanks to its vast Black Sea coastline, its extensive access to the Danube and its numerous high-mountain rivers, lakes and reservoirs, Bulgaria has an abundance of freshwater and saltwater delicacies to choose from! The Bulgarian fish and seafood tradition has a lot in common with how seafood is prepared and eaten in the wider Mediterranean region. However, the peculiarities of the Black Sea, with its relative isolation from the World Ocean, its anoxic depths, lower salinity and variety of marine life, add a unique touch to Bulgarian seafood. You won’t find native calamari, scampi or octopus dishes in Bulgarian restaurants, for instance (as they’re more than likely to stem from the markets in Thessaloniki), but you can feast on freshly-caught mussels, shrimps and rapa whelks! From Bulgaria’s ubiquitous alternative to fish and chips to the Eastern Balkans’ favourite roe dip, kashkaval tourist presents 7 mouth-watering Bulgarian fish and seafood dishes. And as a bonus, there’s a list of my favourite fish and seafood restaurants at the end! 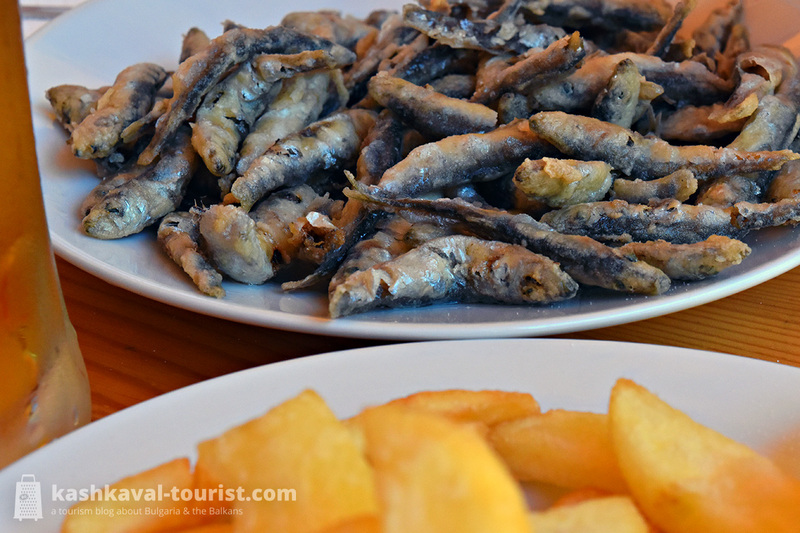 Walk by any little park or beach eatery in Bulgaria at the height of summer and you’re almost guaranteed to sense the smell of fried sprats. A national obsession with the funny-sounding name tsatsa (цаца), this crispy seafood snack is the perfect companion to a cold beer on a hot day. 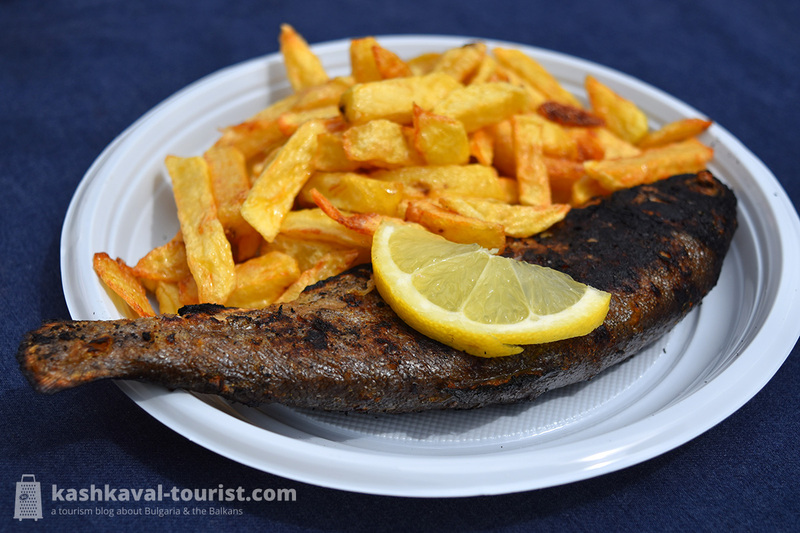 It’s essentially a meal of dozens of small herring-like fish (Sprattus sprattus), salted, coated in flour and deep fried, heads still on and all. Serve fried sprats with a slice of lemon, some French fries and an ice-cold Bulgarian draught beer and you’ve created a legendary dish with minimum effort. In summer days, fried sprats are so popular out in the open that they even rival the ever-present kebapche. Locally, their cult status is only comparable to the institution that is fish and chips in the United Kingdom! Dark Mediterranean mussels (Mytilus galloprovincialis) are one of the most widespread molluscs in the Black Sea and a favourite Bulgarian seafood. These days, over 40 mussel farms produce them in ecologically pristine areas of the Bulgarian coast, so they’re a regular feature in restaurants. 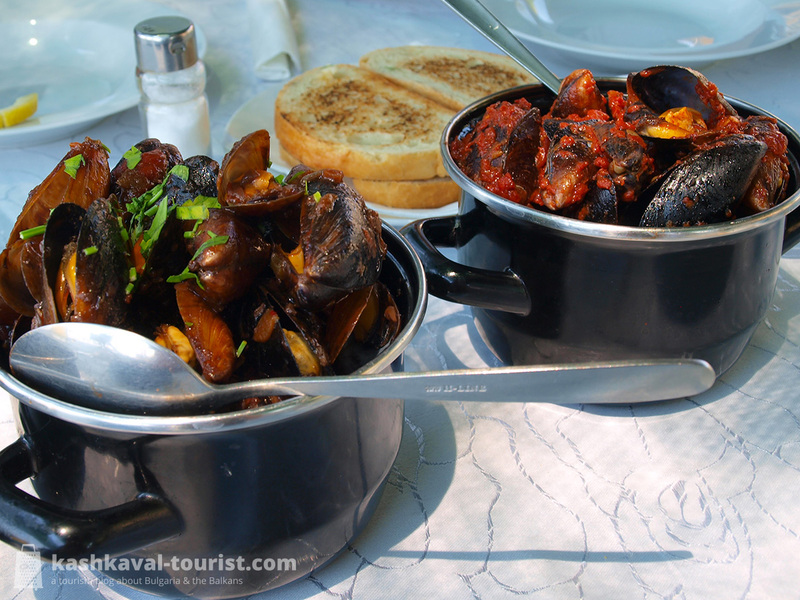 In Bulgarian cuisine, Mediterranean mussels, called simply midi (миди), are cooked in countless variations. These tasty and quite nutrient molluscs can be the chief ingredient of a mussel soup or a mussel salad. And as a main course, they’re usually stewed (often in white wine) and served with the shells. In that case, they’re accompanied by a vegetable sauce as midi plakia (миди плакия) or simply seasoned with fresh lovage. The specific assortment of spices and the way they are used plays a huge part in shaping the general flavour of a national style of cooking. In Bulgarian cuisine, which is a trademark representative of Balkan cooking, spices serve the important task of bringing out flavours and hold the key to making a dish taste quintessentially Bulgarian. Needless to say, preparing authentic Bulgarian food would be unthinkable without the local variety of seasonings. 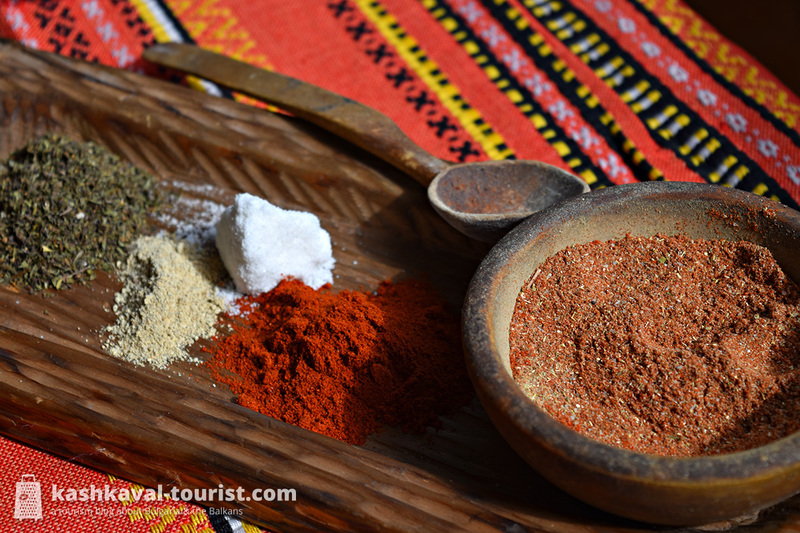 After all, Bulgarian cuisine is not just what we eat or drink, it’s also how we flavour it! 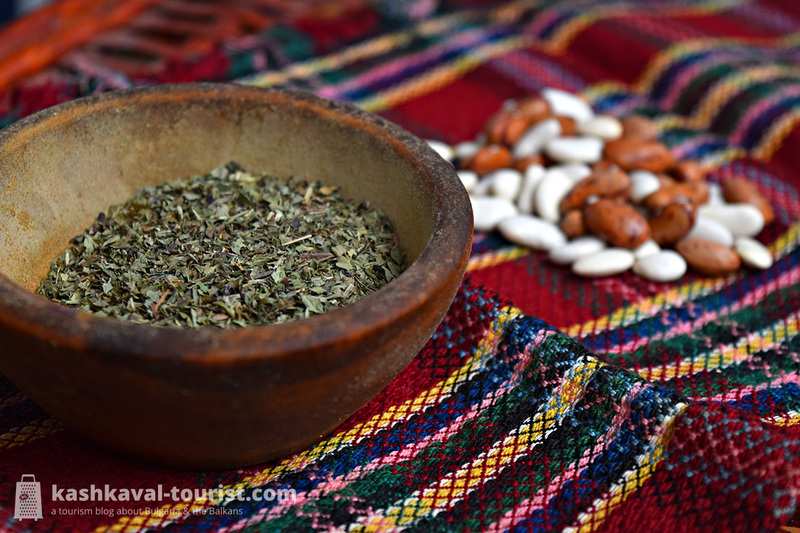 From the nation’s all-time favourite spice mix to the most appropriate spices to use for Bulgarian-style beans, meat or fish, kashkaval tourist will introduce you to the world of 8 Bulgarian spices that define the local cuisine. Sharena sol (шарена сол), meaning “colourful salt”, is without a doubt the most popular spice mix in Bulgaria and a feature in practically every Bulgarian spice rack. Ingredients and proportions tend to vary a bit, depending on the preferences of whoever prepared it. Sharena sol just can’t go without the holy trinity of salt, dried summer savoury (chubritsa) and sweet paprika, but fenugreek is a popular fourth ingredient, and thyme or roasted maize are common additions too. Sharena sol tastes great on freshly baked bread or any other kind of savoury pastry, but it can also be applied to eggs, soups and almost every other dish, as long as you want an unmistakably Bulgarian flavour. Legumes like beans and lentils are the basis of many Bulgarian soups and main courses, particularly in the mountainous regions where they are most often grown. And the seasoning Bulgarians most often use in bean recipes has to be the aromatic spearmint (Mentha spicata), locally called dzhodzhen (джоджен) or less often gyozum (гьозум). The leaves of this Mediterranean perennial plant can be used fresh or dried. In any case spearmint brings a strong fresh aroma to the table that is a perfect match for those delicious Smilyan beans from the Rhodopes. In Bulgarian cuisine, spearmint is also used in lamb and rice dishes. It tends to be a very dominant taste, so it should be carefully paired with other spices, which it can easily overpower. Like elsewhere in Europe, the holiday season starts in early December, with the preparations for Christmas and New Year’s Eve, two of the biggest holidays of the year. Unlike other places, though, Bulgaria tends to do the holiday season in quite a weird way. There’s no Advent for most of us and Saint Nicholas won’t bring you gifts (unless you count seafood), but we’ve gone all out with our own set of quirky ways to mark the holiday season at the end of the year. From the students’ crazy party holiday on 8 December to the customary Bulgarian beating with sticks for good luck on New Year’s, kashkaval tourist presents X unusual Bulgarian holiday season traditions! 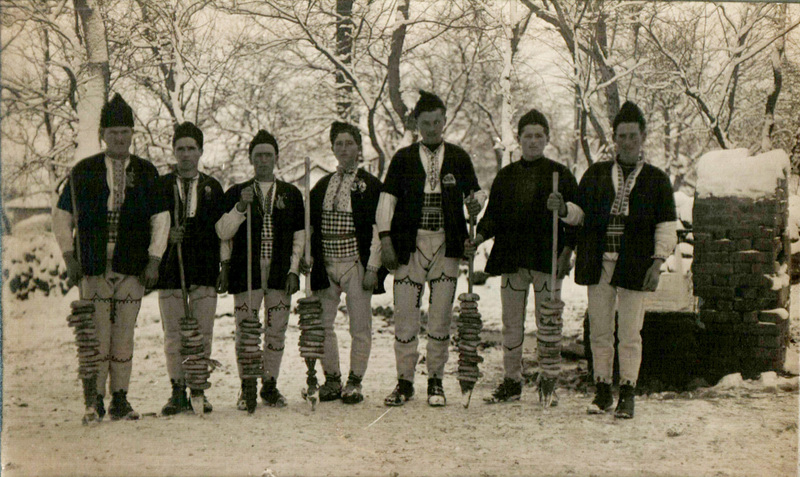 A group of survakari from the region of Sofia on their way to delivering a traditional beating. A tradition rooted in antiquity, survakane is basically children (lightly) beating adults on the back with elaborately decorated sticks! Along with the beating, the children recite cryptic incantations supposed to bring good luck to the adult, and at the end, the kids receive some money for their “service”. The custom takes place on New Year’s Day (1 January) each year, a holiday the Bulgarians once called Survaki (Сурваки). Though the ritual varies from region to region, survakane is popular throughout Bulgaria. The stick, named survachka (сурвачка), is always made of a cornel branch adorned with yarn, wool, dried fruit, beads and other small items. You may be aware of Saint Nick as the precursor to the modern Santa Claus, and in Western and Central Europe he is still hailed as a bringer of gifts. In Bulgaria, just like in neighbouring Greece, Saint Nicholas is the patron saint of sailors and fishermen. The maritime association is carried over to the traditional meal of the evening: fish or any seafood is an absolute must and the most popular dish is ribnik (рибник), carp wrapped in dough and filled with walnuts, onions and raisins. Known locally as Nikulden (Никулден), in Bulgaria Saint Nicholas’ Day falls on 6 December. Because many Bulgarians are named Nikolay or Nikola, this is a very popular name day and a great occasion for a gathering with family and friends… as long as there’s fish on the table! Bulgarian food is tasty, fresh and hearty. Bulgaria is famous for its quality vegetables and dairy products and its variety of mild spices. Pork and chicken are the most common forms of meat, though seafood, fish and veal dishes are also popular and lamb has a special traditional place in Bulgarian cooking. While many of the staples of Bulgarian cuisine you would also find in Turkey, Greece or Serbia, in Bulgaria each of those has its own local flavour to set it apart from the Balkan neighbours’ version. From hearty salads through delicious pastries to grilled meat classics, here’s 7 Bulgarian dishes you absolutely must try during your stay in the country! This piece of greasy pastry deliciousness can be purchased in bakeries all over the country. Its standard variety includes a filling of feta-like white cheese (сирене, sirene), though varieties filled with onions, cabbage, spinach, mushrooms or pumpkin can also be found. For your sweet tooth, you can also try banitsa with apples and walnuts. 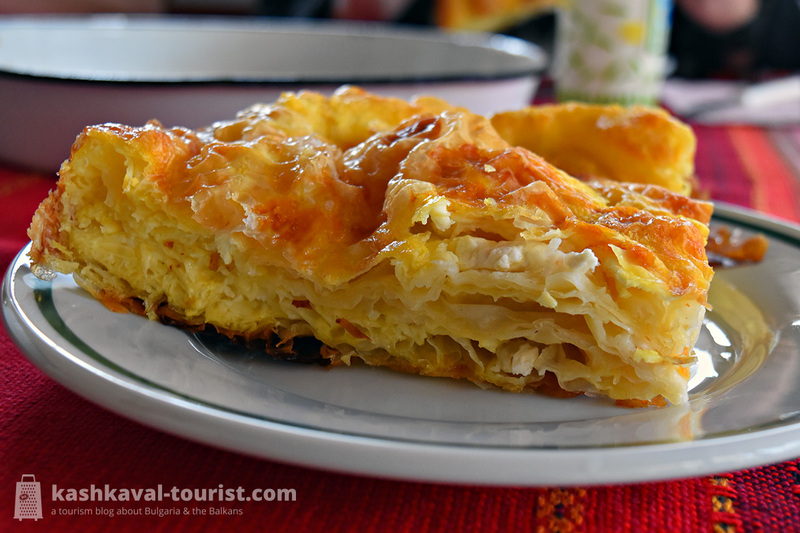 Banitsa in any of its forms is an inseparable part of a traditional Bulgarian breakfast. Combine it with the thick fermented wheat drink boza for a quintessential Bulgarian experience. Holiday tip: careful when chewing your piece of banitsa at Christmas or New Year’s Eve! On those dates, banitsa is filled with lucky paper charms which are sometimes easy to chew through. The luckiest piece will contain the coin which means you’ll enjoy a very successful year ahead of you. The Bulgarian cousin of former Yugoslavia’s famous ćevapčići and Romanian mititei, a kebapche is the perfect side dish to a glass of cold Bulgarian beer on a summer day. Though Bulgarians may argue about that, whether the beer is a Kamenitza or a Zagorka makes no big difference. 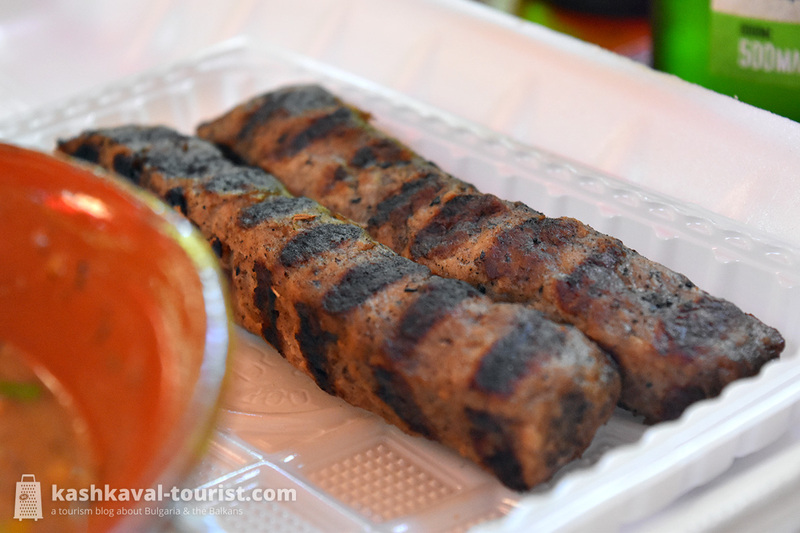 The important part is that the kebapcheta are at least three and include some kind of sides, usually French fries with grated sirene cheese on top, to make the classic “three kebapcheta with sides” (тройка кебапчета с гарнитура, troyka kebapcheta s garnitura). The dish itself is an elongated piece of grilled minced meat, comparable in shape and size, though not in contents, to a hot dog. As with the smaller ćevapčići that you can taste in Serbia, the meat is usually a mix of pork and beef, though it can be solely pork just as well. A beef version exists, but is uncommon and will normally be labeled as such. Typically, spices like black pepper and cumin will be added to the meat, for a mildly spicy taste.